Annan lifted another three precious league points and bounced back from their shock Scottish Cup Exit with a much needed victory over Cowdenbeath who like Annan have been dragged into the relegation zone alongside four other teams in this highly competitive SPFL league. It was by no means a classic match with Cowdenbeath enjoying the majority of the open play and you could appreciate how they came to Annan looking to add their recent excellent form with 2 victories over Clyde and Montrose and 2 draws away to Edinburgh City and Berwick Rangers. On this occasion Cowdenbeath rarely looked like breaking down the compact Annan defence who apart from a rare moment of madness from Stephen Bronsky who’s second half pass back laid the ball on a plate for Nicolas Todorov but the striker was thwarted on the edge of the box by an excellent Blair Currie save. This apart Cowdenbeath appeared to play into Annan’s hands by playing high balls into the heart of the Annan defence which were continually being mopped up by the home defence. The starting line up showed a couple of changes from the previous week with Adam Asghar starting in place of Raffi Krissian who was relegated to the bench and trialist Christian Nade starting up front in place of Max Wright and Callum Home was given a debut starting at the centre of defence alongside Stephen Bronsky. Annan also included emergency loan signing Nathan Flanagan from St Mirren on the bench. Cowdenbeath started very promisingly with Mullen shooting over the bar and at the other end Ramsay headed over the bar as Annan broke down the right it was however Cowdenbeath who made the running in the opening ten minutes but without making any impression on the Annan defence. Annan opened the scoring in the 15th minute when a surging run by Darren Ramsay from deep inside his own half started the move pushing the ball wide to McKenna who’s cross found Barry Cuddihy who forced David McGurn to parry the effort only as far as Ramsay who finished the move he started by prodding the ball home from close range. It was one of the few moments in the half which looked like producing a goal. Half chances fell to Adam Asghar and Kris Renton who blasted over the bar after being set up by Dean Brett. Annan almost got caught at the start of the second half following a Darren Ramsay corner when The Blue Brazil broke to the other end of the park and Craig Johnston sent in a low curling low shot from the edge of the box which went narrowly past the post. Barry Cuddilhy was denied by a superb David McGurn save when he tipped over Cuddihy’s dipping 25 yarder for a corner. 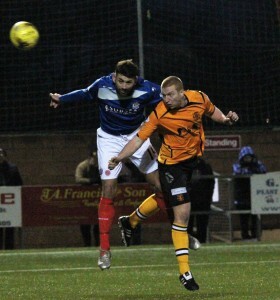 It was a fine effort from the Annan midfield player who had a big impact on the match. Annan doubled their lead in the 61st minute after they were awarded a free kick when Nade was taken out by a poor Brett challenge who was booked and Ramsay’s resultant well directed free kick was guided into the net via the head of man of the match Steven Swinglehurst to give Annan a 2 goal cushion. Cowdenbeath were fortunate when David McKenna beat the offside trap after making a surging run from the half way line to latch onto Jean Guy Lucas‘s penetrating pass but the weak shot never troubled McGurn. Muirhead and Todorov had efforts which went past the post and over the bar. Todorov was then presented with a great opportunity when Bronsky’s poor pass back was perfectly weighted for the striker who was denied by a swift interception by keeper Blair Currie. As the match entered the last quarter substitutions were made by both teams but scoring opportunities were at a premium. Both Annan and Cowdenbeath are locked in a battle alongside Berwick, Edinburgh City, Montrose and Stirling Albion to avoid the bottom place and with only 5 points separating the 6 teams the battle looks like intensifying as the season approaches the second half of the season..
ANNAN ATHLETIC: Blair Currie, Jean Guy Lucas, Ryan Sinnamon, Stephen Bronsky, Steven Swinglehurst, Barry Cuddihy, Adam Asghar, Trialist (Aiden Smith 77 min), David McKenna (Nathan Flanagan 82min), Callum Home ( P Watson 46 min), Darren Ramsay. Subs not used : Alex Mitchell, Raffi Krissian, Max Wright, Ellis Pearson. COWDENBEATH : David McGurn, Dean Brett (Shaun Rutherford 82 min) , Brian Ross (David Robertson 67 min), Kyle Miller, Fraser Mullen, Craig Johnston (Cameron Muirhead 60 min),Kris Renton, Lewis Moore, Gerry McLauchlan, Nickolas Todorov, Jamie Piper. Subs not used : Burton O’Brien, Christopher Turner , Craig Sives. Jamie Sneddon GK.